Buffalo sauce chili is hearty and the perfect use for leftover buffalo sauce. Tailgating, anyone? After last week’s Super Bowl, I felt the urge to eat food fit for a tailgate. I guess in my own way, I was lamenting the end of football season. Usually, football ends and the city of Chicago sets into a deep freeze. This year was literally no different as we were pummeled with our 5th largest snowfall in one day, ever, on game day. Don’t worry, I’m not going to go jabbering on about the weather or sports. I have done more than enough of that this year already. Come Monday morning, football was over for the year and I was shoveling 2 feet of snow. All I wanted to do was curl up with some buffalo wings, a glass of red wine, and a book. Don’t judge – wings, wine and books go well together. Anyway, Mr. B is always off of work on Mondays and we invite our neighbor Z over for dinner. We have been doing this every Monday for a few months and it works out perfect for all of us. I cook a bunch of test recipes during the day and at night, the two guys sample them and let me know what they think. Thanks to them, several recipes never made it on to this site and several were improved with their suggestions. It’s nice to have your own taste test panel in your home. After dinner, the guys hang out and I get to work, writing notes and schedules for myself for the rest of the week. This recipe for buffalo sauce chili was one of those test recipes, and last Monday my taste testers helped me make it perfect. The name may sound silly, and maybe a little weird, but it’s the best way to describe it. Also, it’s the perfect use for last month’s homemade buffalo sauce recipe. Which, if you made a batch for the Super Bowl and are still holding on to it… well, it’s time to use it up. If you don’t have any buffalo sauce handy or don’t feel like making your own (hey, we are all allowed a lazy day here and there), I have a substitute for you. For this chili recipe only. You can substitute buffalo sauce for 1 part hot sauce and 1 part butter. 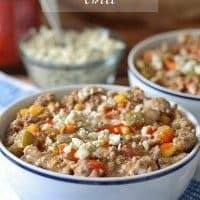 I say for this recipe only because there is a lot going on in the chili. You probably wouldn’t notice that the spice and flavor that make my buffalo sauce recipe so unique are missing. 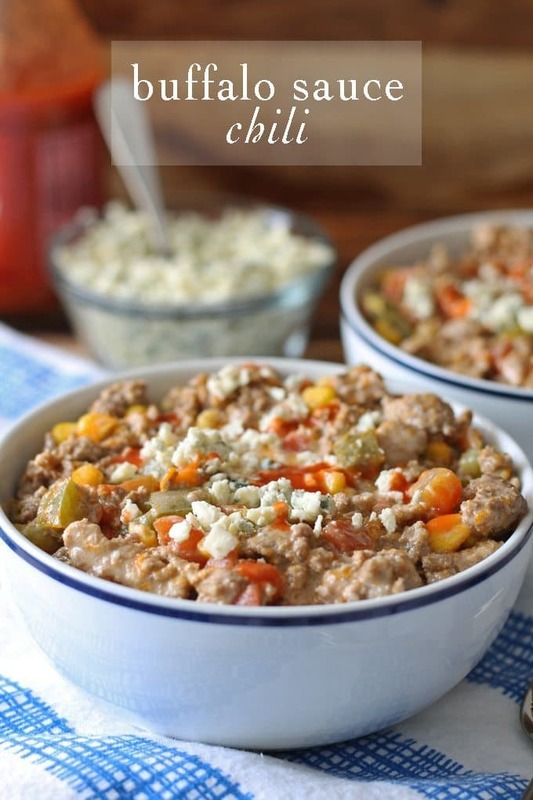 But no guarantees there – I still recommend using buffalo sauce for this chili. It is buffalo sauce chili, after all. In a large soup pot over medium high heat, brown the ground beef. When completely browned, drain the fat and return pot to stove. Add the tomatoes, chicken broth, green peppers, corn, onion powder, celery salt, parsley and salt. Turn heat to medium high and bring to a boil. Reduce heat and simmer for 30 minutes. 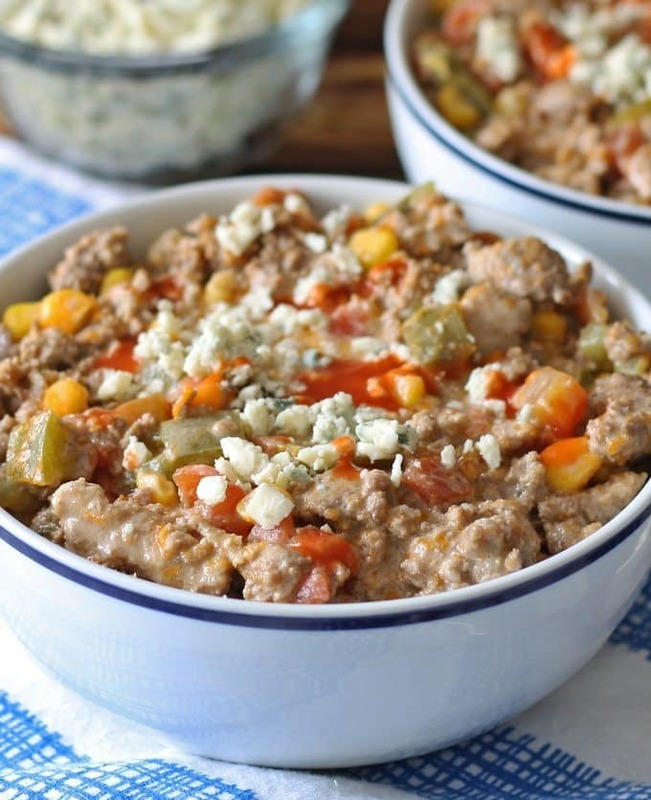 Add the cream cheese, blue cheese and buffalo sauce and stir. Cook for an additional 10 minutes, or until the cheese is melted. 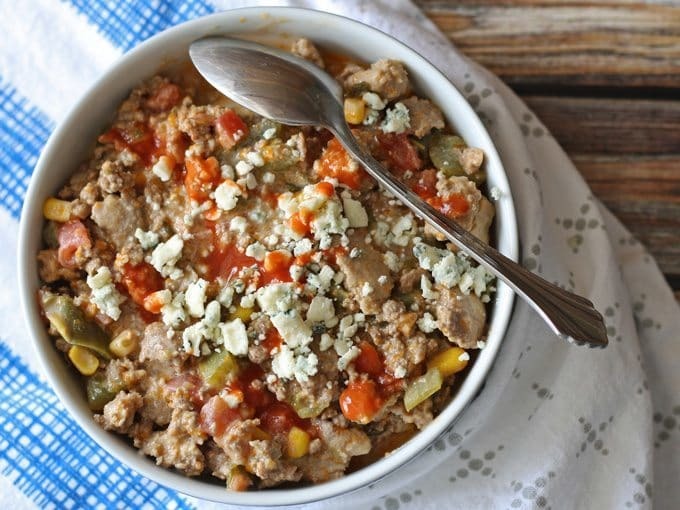 Serve with additional crumbled blue cheese and buffalo sauce. Looking for more ways to use buffalo sauce? Check out these buffalo sauce recipes. Ps will come back and rate the recipe once I’ve made it! What a tasty looking dish! I cannot wait to try this out! Looks great! Thanks for sharing on the “What’s for Dinner” link up! What a great recipe. Thanks for sharing with us at Throwback Thursday. Pinned and shared! Looks so good. Pinned & shared. Thanks for joining the party! Have a great weekend.